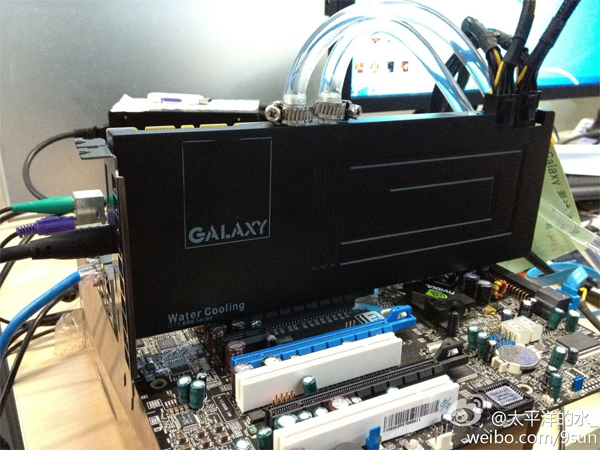 A well known graphics card manufacturer known by the name of ‘GALAXY’ has had it’s team in touch with enthusiast water cooling overclocker expert ‘Water God’ for testing it’s upcoming water cooled variant of Nvidia’s recently launched Kepler based GTX 680 GPU and it’s image has surfaced on a popular micro blogging site in China. For those of you familiar with the GTX 680 graphics card, this is not a reference card from any angle, notably the card lacks DVI ports with the 6 and 8 pin connectors now in parallel instead of being on top of one another. Also, the biggest change with this variant is it’s a single full slot graphics card! No more details have been given on the card as of yet only the image above. However, the reference GTX 680 ships with two DVI ports, one mini HDMI, and two mini DisplayPort connectors. This card is expected to have higher clocks and probably a better and reinforced PWM design and chokes for extreme overclocking under water cooled setups. Galaxy has also a previous history of churning out high end single slot graphics cards without compromising on performance. So one can expect some serious power with this edition as well!